Known as Matterhorn in Switzerland, Monte Cervino in Italy, and Mont Cervin in France, this is certainly the most iconic peak in the entire Alps. Often referred to as “the Mountain of Mountains”, this large almost-symmetrical pyramidal peak is every mountaineer’s dream. Standing at 4,478 meters (14,692ft), Matterhorn is the fifth highest peak in the Alps. It is located on the border between Switzerland and Italy, in the Monte Rosa area of the western Pennine Alps. The mountain dominates the Swiss village of Zermatt, in the German-speaking canton of the Valais, to the northeast, and the Italian alpine resort of Breuil-Cervinia, in the Aosta Valley region, to the south. Matterhorn is probably the most photographed mountain in Europe. It is famous for its four picturesque ridges (Hörnli, Furggengrat, Liongrat, and Zmuttgrat), which split the mountain in four steep faces that rise above massive surrounding glaciers, pointing to the four compass points. Three of Matterhorn’s faces (north, east and west) lay on the Swiss side and one (south) on the Italian side. About 3,000 people climb the Matterhorn every year. However, it is not an easy ascent. It is quite technical and physically demanding, therefore it is advisable that you do it along with a professional mountain guide. Those who endeavor to attain the summit need to have prior climbing experience and a good fitness level, as well as to warm up with other less demanding ascents first. Interested in venturing up to Matterhorn? Below you will find all the essential information for you to start planning your trip! Matterhorn can be climbed from both the Italian and Swiss sides, depending on the route you choose. If you decide to climb it from the Italian side, you will have to travel to the resort town of Breuil-Cervinia, located in the beautiful Aosta Valley, in the commune of Valtournenche, in the country’s northwest. Cervinia is about 30 kilometers from the main Aosta Valley motorway (A5 Torino-Aosta), so it is easily accessible by car and public transportation. The most convenient airport is Turin Caselle (118 kilometers away from Cervinia), followed by Milan Malpensa (160km) and Geneva (210km), all of them offering transfers to Cervinia. The nearest train station, Châtillon/Saint-Vincent, as well as stations in Turin and Milan, offer coach service to/from Breuil-Cervinia, as well as regular bus connections. If you choose to ascend Matterhorn from the Swiss side, the starting point will be the village of Zermatt, located in the German-speaking canton of the Valais, in the country’s south. International flights usually arrive at Geneva or Zurich airports, which offer hourly rail connections to Zermatt (3 to 4 hours-long). Private cars are not allowed in the town; if you are traveling by car, the closest you can get is the municipality of Täsch, from which you must travel the remaining 7 kilometers by train or taxi. Driving time to Zermatt from Geneva, Zurich or Milan is 3 and half to 4 and half hours. Today, all ridges and faces of the Matterhorn are climbed in all seasons. However, given the weather conditions, the best time to do it is in summer, from June to September. The normal route from the Swiss side is through the Hörnli ridge (Hörnligrat), Matterhorn’s northeast ridge. It was the route of the first ascent (1865) and it is considered to be the easiest way to the summit. It departs from Zermatt (1,608m). On the first day, climbers usually take the lift to Schwarzsee (which means Black Lake), a small lake on the foot of Matterhorn, at 2,552 meters, and then hike uphill for about 2 and a half hours (700 meters ascent) to the Hörnli hut (3,266 meters), where they spend the night, as suggested by IFMGA-certified guide David Henzen. Alternatively, mountaineers can directly set off on a 950m-climb from Zermatt to Schwarzsee, which takes about 3 hours. On the second day, they try to reach the summit, which involves a 6-hour sustained climbing over a distance of 1,700 meters and a vertical rise of 1,200 meters. In good weather days, during the high season, this route is usually very crowded. The descent is through the same trail and takes about 5 hours. From the Italian side, the normal route is via the Lion’s ridge (Liongrat or Cresta del Leone), Matterhorn’s southwest ridge. It was the route of the second ascent, accomplished in 1865 as well, and it is considered to be slightly harder than the Hörnli ridge. It starts from Breuil-Cervinia (2,006m). On the first day, mountaineers climb 1,800 meters over 6 hours to the Carrel hut (Rifugio Carrel) at 3,829 meters, where they spend the night. The less tiring alternative is to take a cable car from Cervinia up to the Plan Maison station (2,548m) or a jeep to the Abruzzi hut (also known as Rifugio Orionde) at 2,802m, and then hike to the Carrel hut, as suggested by the guides in the Peakshunter team. On the second day, they attempt to reach the summit, on an estimated 5-hour ascent with a 650-meter vertical height gain. Descent is along the same route. The third most popular track to Matterhorn is through its northwest ridge, the Zmuttgrat. It is slightly more difficult than both mentioned above, especially because it is often out of condition given its northern exposure. The ascent’s starting point is usually the Hörnli hut – or alternatively the Schönbiel hut (2,694m) – and it takes around 2 to 3 days (10 hours). The Furggengrat, Matterhorn’s southeast ridge, is the hardest and it is not frequently climbed. It was the last one to be ascended. It involves an overnight at the Bivacco Bossi hut (3,345m) and a 7-hour hike to the summit. Finally, the Schmidt route climbs Matterhorn via its north face, which consists of a 1,200-meter wall, one of the longest in the Alps. It is a very technical ascent, first attained in 1931. For safety reasons, it can only be climbed during fall and spring. IFMGA-certified guide Enrico proposes a 3-day trip departing from Zermatt with descent via the Hörnli ridge. Whatever the route you take, it will certainly be a unique experience. 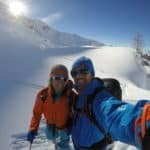 If you are a mountaineering fan, you will definitely enjoy the challenges encountered on the way up, as well as the most rewarding and breathtaking views from the summit over the Alps’ major snow-covered peaks and far away valleys. As mentioned above, most guided ascent and descent expeditions to Matterhorn take between 2 to 3 days, and involve climbing to a mountain refuge on the first day, while reaching the summit and returning to the starting point on the second day. However, please note that before climbing Matterhorn you will need some acclimatization. Given this, plus the fact that unpredictable weather often forces mountaineers to postpone the ascent, you should estimate to stay for a week and a half or two in the area. Both Zermatt and Breuil-Cervinia are important mountain resorts with numerous lodging alternatives of all types and price ranges. During the ascent to Matterhorn, overnights are in mountain huts. These usually provide beds with blankets, gas stoves, and half-board meals (breakfast and dinner). Be mindful that, due to the lack of a water source, there is no drinkable water available in the refuges. You should carry your own water bottle or boil mountain water before using it. The Hörnli hut has capacity for 120 climbers and the Carrel hut for 45. Half-board overnight accommodation costs around 150 CHF (€138) at the Hörnli Hut and €15 at the Carrel hut. Payment is done on site, only in cash in Swiss francs or euros. Mountain refuges are quite crowded during the summer. So make sure to book in advance! Matterhorn is not an easy climb. Both ascent and descent are technically and physically demanding, given the mixed terrain and high altitude weather conditions. Trails feature some very steep sections, covered with snow or ice, and there is risk of rock fall. In addition, while there are fixed ropes on some parts of the track to help alpinists, they often have to climb unbelayed. All routes to Matterhorn require prior high altitude mountaineering experience, an excellent fitness level, and hard physical preparation and acclimatization on one of the surrounding peaks in the area (see “How to prepare for climbing Matterhorn” below). The best season to climb Matterhorn is from June to September (see “Where and when” above), after the winter snow has melted and before the less stable fall weather arrives. During the summer, temperatures in the mountain are around -10ºC (14°F), and snowstorms and thunderstorms are quite frequent. However, given its great height, its steep faces and its isolated location, Matterhorn is exposed to high winds (about 70km per hour) and rapid weather changes, often forcing climbers to postpone their plans. For a safe ascent, the weather window in Matterhorn needs to be absolutely clear. Therefore, it is advisable to include a few extra days on your itinerary. Most guides only take 1 climber to Matterhorn. This allows a personalized experience, and ensures a safe and successful ascent. Given the unpredictable weather conditions in Matterhorn, you should pack thoroughly but light! It is advisable to apply the “layer system”, selecting lightweight and functional gear, that doesn’t take much space in your backpack and dries quickly. Below is a list of the recommended personal gear for ascending Matterhorn. Guides usually provide the group equipment, but remember to reconfirm this and go over the list with your guide before the expedition. Climbing gear: classic crampons, ice axe, harness, 2 screw carabiners and slings, helmet. These can usually be rented in sport shops in Zermatt or Cervinia. Other items: rucksack (30-45 liters), head torch with additional batteries, daisy chain or longe, sunglasses, sunscreen, 2-liter water bottle, snacks, travel insurance details, cash (Swiss francs and euros). A normal 2-day ascent to Matterhorn can cost around €1,300, such as the guided climb via the Hörnli ridge led by IFMGA-certified guide Guy Robert May. Longer programs that include acclimatization days can cost between €1,800 and €5,000. There are no official permits required for climbing Matterhorn. As mentioned above, this ascent requires previous acclimatization. If the selected program does not include preparation, you will need to book it separately. The section of the Pennine Alps where Matterhorn is located comprises most of Western Europe’s highest mountains. Therefore, besides Matterhorn, there are several other mountaineering and trekking activities available in the area, some of which can also serve as acclimatization before your ascent. Many of these outings depart from Zermatt and Breuil-Cervinia, as well as from other surrounding towns. Some guides also offer longer adventures that include climbing Matterhorn as well as other iconic peaks in the Alps, such as the 12-day ascent to Mont Blanc, Matterhorn and Eiger with preparation suggested by IFMGA-certified guide Francis Kesley. Climbing the legendary Matterhorn is definitely a unique and memorable experience. Check out the numerous Matterhorn ascent programs you can book through Explore-Share.com!